Will we have the privilege of seeing the "Jet" in this years' NBA Finals? 1. Heat win, yet LeBron is still criticized. Will everyone just shut up already? I’m sick and tired of hearing about what LeBron didn’t do in the 4th quarter. Why don’t they talk about what he did do? Everyone continues to focus on the number of points he scores instead of looking at all the aspects of basketball. LeBron affects the game in MORE ways than anyone in the league. Offensively, Dallas has to send some kind of help when LeBron has the ball. Either if it’s a shade or a double-team, you have to scheme for him. If not, he has the abilities to blow right by your defender to the basket. Defensively, LeBron can guard anybody on the court, at anytime. He can win rebounds, block shots, and disrupt the passing-lanes. Whenever he isn’t scoring, he’s doing all the intangibles. People seem to forget that it was LeBron who had dished the rock to Bosh for the game-winner. If he was so worried about droppin’ buckets, he would have stayed in Cleveland. Everything seems to be a lose,lose for LeBron. 2. Why the hell isn’t Dirk being criticized? In the final three possessions, Dirk had a chance to tie/win the game, but blew them all. On Dallas’ second-to-last possession, Dirk threw the ball away to the fan sittin’ front-row because of the Miami’s double-team. Then on Miami’s following possession, Dirk got lost behind a Haslem screen allowing Bosh to hit the game winner. Finally on Dallas’ last possession, Dirk had a chance to tie the game with a jumper at the free throw line, but he clanked it off the back-iron. He simply faltered with the game on the line. I don’t care if you scored 30+ in the first three quarters; you have to make the one that counts. You can also defend a little bit better too. At this stage you have to find away to get through screens to the open shooter. 3. Will the “Jet” finally step up in Game 4? ESPN reported that Dirk called out Terry, saying he hasn’t been “clutch”. He is 100% correct there. Terry has been pretty much ineffective throughout most of this series. Yeah, he got lucky and hit a few buckets, but his shooting percentage has been significantly lower than usual, and he’s been turnover prone. LeBron James has clamped the locks down on Terry in Miami’s two wins. With LeBron being much stronger and faster than Terry, Rick Carlisle needs to do a better job of moving the “Jet” around before he gets the ball. Set multiple screens for him in order to let LeBron work. I’m sure running off a screen will give Terry a little more breathing room. If executed properly, it should give him the option of driving or spotting-up. If Terry doesn’t step it up in Game 4, then it’s basically over. He needs to give Dirk some sort of support in the closing minutes. The Mavs have been relying on Dirk too much and it will finally take its toll. Just ask Derrick Rose. Oh yeah. Terry, you better starting looking for tattoo removal centers……. 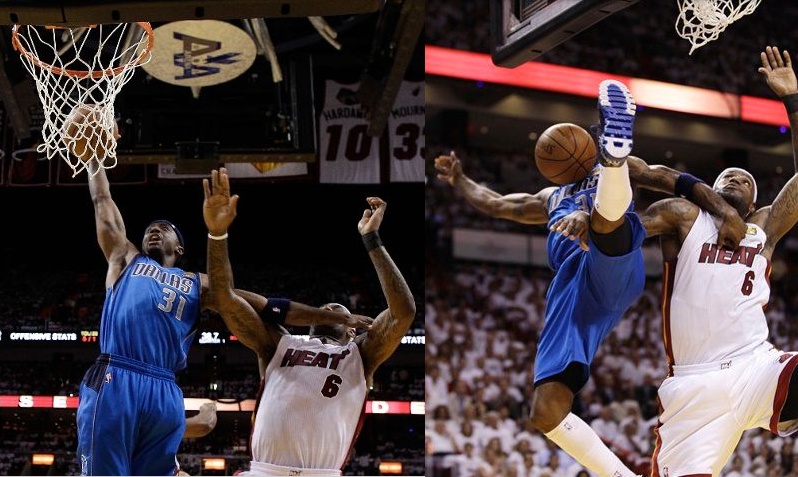 Dallas guard Jason Terry attempts to dunk on LeBron James and is rejected by the rim. Luckily, he was bailed out by a questionable foul call. Defense and Match-Ups. That was the biggest difference in game 1. Unfortunately, neither went in Dallas’ favor. In the final 5 minutes of game 1, Miami’s big three ate up Dallas’ squad. The match-ups on both ends of the floor were easily dominated by the Heat. 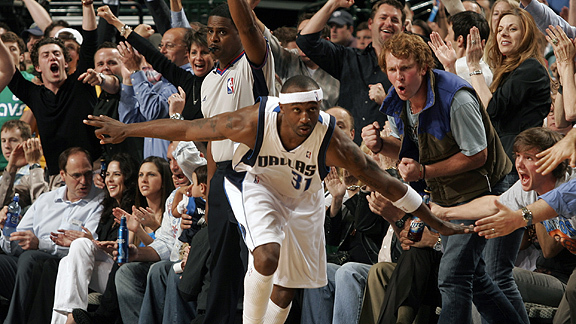 Jason Terry looked like a lost, step-child out there on the floor. Terry was absolutely abused last night on both ends of the floor. He was unable to stop (let alone contain) D. Wade in the game’s most critical moments. Wade knows Terry can’t guard him. Hell, we all knew that coming into this series. Wade can post Terry up, beat him off the dribble, or just shoot over him. On the offensive side of the ball, Terry was irrelevant as soon as LeBron took over guarding him. LeBron’s size and quickness will be no match for Terry, as he looked really uncomfortable out on the floor. Terry is going to be critical in this series, as he needs to step up and be a reliable option besides Dirk. Dirk was hounded all night by Miami’s team defense and will be relying on his teammates to pick up the slack. I thought the Heat did a great job being aggressive with Dirk when he didn’t have the ball in his hands. They made is really difficult for Dirk to get to this favorite sweet spots on the court, and when he did, there were a number of bodies in his face. Haslem did an outstanding job making life difficult for Dirk. Haslem and the Heat displayed solid pick n’ roll defense throughout the game. In the previous series, Dirk would be able to find his open shooters once the openings developed off the pick n’ roll, but things weren’t as easy in Miami. Miami’s quickness and length made it difficult for Dallas to execute its offense. Miami has the speed to not only help out on defense, but can close the gap on the Mavs’ perimeter shooters. Currently, most of the match-ups are riding in Miami’s favor. Unless Dallas’ core players surround Dirk step up, it’s going to be another season of underachievement for the Mavs. What I want to know is, why in the hell did Rick Carlisle go away from the 2-3 zone in the second-half? It was working in the first-half and that was one of the biggest reasons why Dallas had the lead. Miami showed its vulnerability against the zone, so why go away from it? Well Rick, you better get to work. Roughly 90% of teams up 2-0 in the NBA Finals go on to win the title (the 06’ Dallas Mavs are one of the few to choke it away). Photo courtesy of ESPN.com and NBA.com.